Dr. JOAN PUJOL RAFOLS is currently Chief of General and Digestive Surgery at Tres Torres Hospital in Barcelona and Head of the Bariatric & Metabolic Surgery Unit (UCOM-Clínica Tres Torres). He is titled as an Expert in Bariatric and Metabolic Surgery by the Spanish society, of which he was one of the founding members. In 2012 was given the IFSO AWARD of Appreciation for his great contribution to the growth of the world federation. 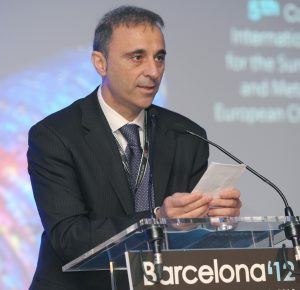 He has been involved in many scientific events related to metabolic and bariatric surgery including being the President of the 5th IFSO-EC Congress which was held in Barcelona. He was a member of the organizing committees of the 8th IFSO World Congress, 5th International Symposium on Laparoscopic Obesity Surgery, 17th International Symposium on Obesity Surgery and the 10th Congress of the Spanish Society for Obesity Surgery. He has been a Member of the Executive Council of The International Federation for Surgery of Obesity and Metabolic Diseases European Chapter. He has authored and co-authored relevant articles, chapters and books and is a regular reviewer of international scientific journals in the field of bariatric surgery such as Obesity Facts or BMI Latina. He is the current Chief of the IFSO-EC Communication & Development Committee, a Member of IFSO Investigational Surgical and Endoscopic Procedures Committee and a Board Member of the International Bariatric Club.